A United Nations agency has today feted Kenya for compliance with globally recognized postal addressing standards at the ongoing Postal Operational Council (UPU) meeting in Bern, Switzerland. Presenting the S42 recognition certificate to Kenya, the Director General of the Universal Postal Union (UPU), Amb. 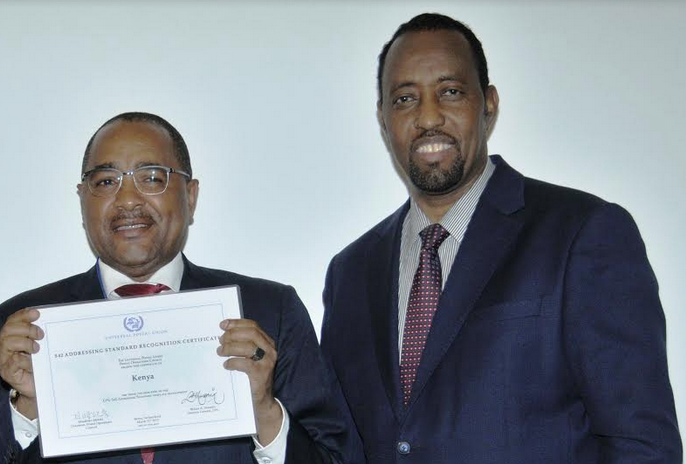 Bishar Hussein congratulated the country on its efforts to establish a national addressing system and align its addressing formats with the UPU’s S46 and S53 addressing standards. The UPU, which is based in Bern, Switzerland, is a specialized agency of the United Nations that sets the rules for international mail exchanges. It also makes recommendations to stimulate growth in mail, parcel and postal financial services. Adherence to the S42 standard will help improve all aspects of mail processing in Kenya by ensuring that a more standardized and universally recognized address format is used for international mailing. Bulgaria, Kazakhstan, Tunisia, and Ukraine were also feted at the fifth annual S42 recognition ceremony. Amb. Hussein noted that making information about Kenya’s address structure available through the UPU would enhance addressing quality worldwide. Mr. Matano Ndaro, the Director in charge of Competition, Tariffs and Market Analysis at the Communications Authority of Kenya (CA), received the certificate on behalf of Kenya. The award of the certificate sets the stage for Kenya to develop a comprehensive National Addressing System (NAS) that shall entail naming and numbering of properties and roads. The NAS is key in stimulating e-commerce in the country and facilitating home delivery of postal items, emergency response, navigation, and revenue collection. Already, Kenya has established a multi-stakeholder national steering committee spearheaded by CA that is driving the implementation of the NAS. The Committee is currently drafting national standards and guidelines on naming and numbering standards, legal and data management frameworks for use by national and county governments. The Committee has representation from CA, ICT Ministry, Postal Corporation of Kenya, Ministry of Lands, National Land Commission, Kenya Bureau of Standards, Kenya National Highways Authority, Courier Industry Association of Kenya (CIAK), Kenya Alliance of Resident Association and Kenya Revenue Authority, among others.